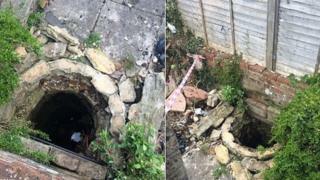 An estate agent has been fined £200,000 after a prospective house buyer who was viewing a property fell into a 30ft (nine-metre) deep garden well. The 39-year-old woman suffered head injuries in the fall in Malmesbury, Wiltshire, last April. Swindon Magistrates' Court heard she stepped on to a wooden board placed over the well which gave way. The Health and Safety Executive (HSE) found Strakers had been warned about the well and the board being unsafe. The woman suffered concussion in the fall, and was submerged in water in the well for an hour before being rescued. The court heard she also suffered post-traumatic stress disorder as a result of the fall. Insp Matthew Tyler said it could have "easily become a fatal tragedy". He added: "If, when warned of the unsafe well, the company had properly checked to see if it was secure the trauma this individual has gone through could have been prevented." Bosses at Strakers, which is based in Market Place, Devizes, pleaded guilty to breaching section 3 (1) of the Health and Safety at Work Act 1974, and were fined £200,000 and ordered to pay costs of £2,474. Antony Bulley, Strakers managing director, said directors and staff had been "deeply distressed" by the incident. "We wish to make it known that Strakers have carried out extensive internal investigations and have fully cooperated with the Health and Safety Executive throughout culminating in a plea of guilty at the earliest opportunity presented." He added that the company's aim is "to ensure that everything possible is done to avoid any similar incident occurring in the future to any member of the public or our staff".